“Nonprofit Fraud Robs Charities of Substantial Dollars,” The Huffington Post, November 16th, 2013. 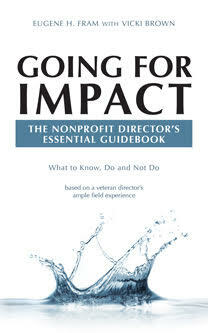 “The Nonprofit Overhead Myth – Devil in the Details? A frank discussion of the overhead myth may impact the very survival of nonprofits,” Nonprofit World, September-October, 2013, p.9. “Preventing and Managing Leadership Crises in Nonprofit Organizations,” in Handbook of Research on Crisis Leadership in Organizations, Andrew J. DuBrin, Ed, pp. 311-330, Cheltenham, UK, Edward Elgar, August 2013. “Can Lead Directors Help Improve Not For-Profit Board Performance? The International Journal of Not-For-Profit Law, Vol. 14 Numbers 1-2, April 2012, pp.57-63. “The Special Relationship: Nurturing the CEO-Board Chair Bond,” Nonprofit World, November/December, 2011. “Designating a ‘Lead Trustee’ Can Help Boards Improve Their Operations,” The Chronicle of Philanthropy, June 2, 2011, p. 34. “What’s in a Name? Benefits of the President/CEO Title,” Nonprofit Director, Alliance for Children & Families website, May 24, 2010. “Who’s On Board,” The Wall Street Journal & MIT’s Sloan Management Review, April 28, 2007, p. R6*. “Are Professional Board Directors the Answer?” MIT’s Sloan Management Review, winter, 2005, pp.75-77. “It’s Not Over For Business & Nonprofit Board Directors – Governance Reform Has Only Just Begun.” The Seventh Biennial J. Warren McClure Lecture, Rochester Institute of Technology, October 16, 2003. Published as: “Governance Reform – its Only Just Begun,” Business Horizons, November-December, 2004, pp. 10-14. “Fundraising Parallel Foundations: What Are They & How Are Nonprofits Using Them?” Nonprofit World, September-October, 2002, pp. 10-14. “Nonprofit Boards Would Profit with Marketers Aboard,” Marketing News, April 29, 1991, p.6. Reprinted in: Goodwill Forum, September 1991, pp. 25 & 27. “Nonprofit Boards: They’re Going Corporate,” Nonprofit World, November/December, 1986, pp. 20‑23 & 36. “Changing Expectations for Third Sector Executives,” Human Resource Management, fall, 1980, pp. 8‑15. “Policy vs. Paper Clips: How using the Corporate Model makes a nonprofit board more efficient & effective,: Third Edition* (Amazon.com), March 2011.